Two colleagues from the WATF team measuring and tuning waveguide components. 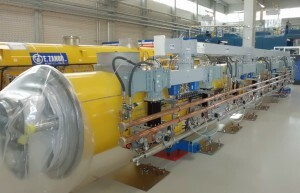 For the operation of the European XFEL, 800 cavities will be installed in 100 accelerator modules. The cavity production has already been outlined in the two previous stories published in LC NewsLine (and first published in DESY inForm). For their assembly, there is a weekly transport of cavities to France. From there, they return to DESY as operational modules where they are tested and provided with a custom-made “energy supply” before they are transferred into the tunnel. The first two stations are located in dust-free cleanrooms. There, the cavities get the “cold part” of their new couplers, provided by LAL (CNRS-IN2P3, Paris-Sud University), and, in the string assembly area, they are assembled to a string of eight cavities. The so-called string is the core of the accelerator module. The next stations are located outside the cleanroom, in regular assembly halls. There, the strings are equipped with several sensors, the helium supply, cables and other parts which are necessary for future operation. This requires great accuracy and care at each individual procedure. No matter whether bolted, welded or stretched – everything must fit perfectly and stay clean. Finally, the module is packed into a large yellow vacuum tank. “Of course, we carry out a thorough quality control at each step. This ensures that each module leaving Saclay is fully operational,” says Napoly. As soon as the completed module has successfully passed the final test, it starts its one-day journey to DESY. Here, it is again received by Jacek Swierblewski ́s team in the AMTF hall. The Polish team from Cracow (see DESY inForm 1/2016) is also running the three module test stands. The test takes 21 days. The module is cooled down to its operating temperature of 2 Kelvin (minus 271 degrees Celsius). The test includes many steps and measurements to ensure the function of the module. Moreover, the accelerating properties of the individual cavities are measured and the data are transferred to the waveguide experts. Waveguides secure the energy supply of the module – they transport the microwaves used for particle acceleration to the cavity. “The measured data from the module tests help us to produce a tailor-made energy supply for each cavity,” explains Stefan Choroba, head of the work package radio frequency system. “First, we calculate the required power distribution and subsequently we adapt the necessary parts.” This customised production takes place in the so-called Waveguide Assembly and Test Facility (WATF), located in close proximity to the module test stands. 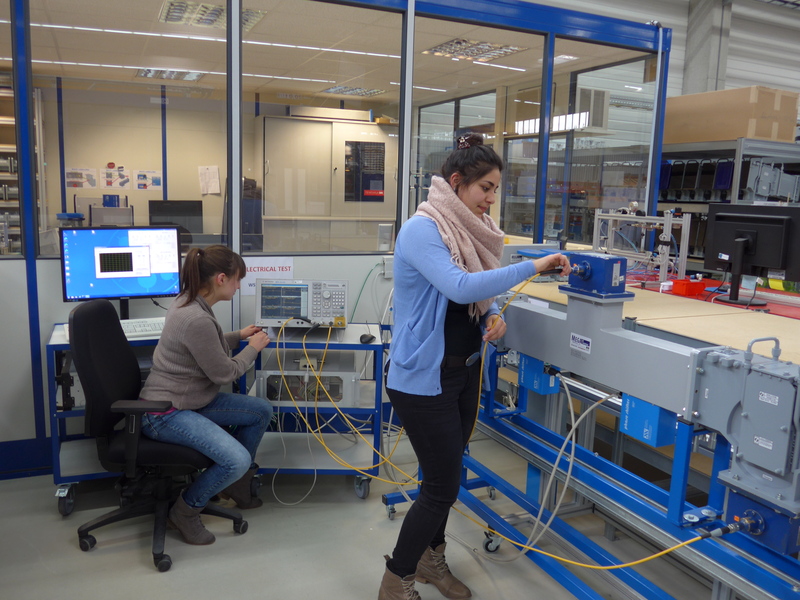 At five stations, a 27-person team from Bulgaria, Russia and DESY assembles the complete waveguide supply for each individual module. “For the waveguides, we have a collection of standard components which are appropriately put together and tuned,” explains Valery Katalev, head of the WATF team. The tuning – i.e. the adjustment to the requirements of each cavity – is carried out with great care. The tailor-made energy supply makes it possible to operate each cavity in each module with maximum capacity. Therefore, the module is not limited by its weakest cavity. When all components are assembled, a load test is carried out with full capacity of up to 2.5 megawatts per distribution system. With this, the colleagues ensure that everything will work in the accelerator as it should. When the distribution system passes this test, the WATF team will mount it at the module. After that, the module with the distribution system is ready for the final step of its journey: the installation into the accelerator tunnel.